Along with Apple’s iPad announcement on Wednesday, the company released updates for pretty much every major iOS app in its wheelhouse. Now, this isn’t all that surprising, given that most of Apple’s apps needed a graphics update to take advantage of the iPad’s Retina display. 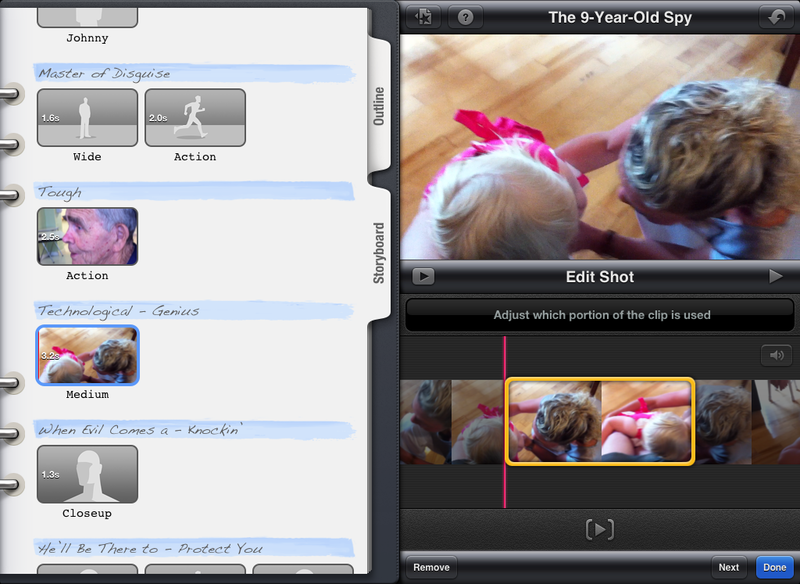 But hidden amongst the tweaks and pixel perfections, some apps also received new features—including iMovie. 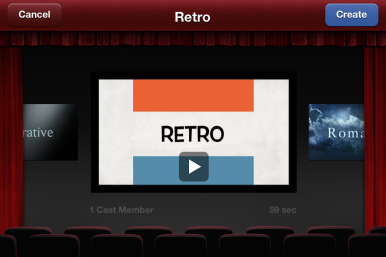 iMovie may not have the flashiest updates of the bunch, but it does gain a neat new feature from iMovie ’11 on the Mac: movie trailers. Now, when creating a new project, you can choose to instead create a trailer with one of nine different templates: Retro, Romance, Scary, Superhero, Swashbuckler, Narrative, Fairy Tale, Expedition, or Bollywood. You can swipe through and preview these for a better idea of what the trailer formats are like—be prepared for child spies and adventuring backpackers. Apple has also commissioned a set of scores for each of these templates. Some of the songs have the veritable pedigree of award-winning composer Hans Zimmer behind them, and were recorded by the London Symphony Orchestra. By themselves, the score snippets aren’t anything I’d choose to listen to in iTunes, but they provide decent atmosphere for the trailers. Once you’re in the editor, you can fill in the outline—which asks for your movie title, actors, the studio title (and logo, of which there are five), and some basic end credits—or illustrate your trailer in storyboard mode. The outline supplies a few key details for the opening and closing of your trailer. In the traditional sense, storyboarding involves putting a rough outline of a film together using sketches and dialogue. Apple’s trailer storyboard is a fair bit stricter, but has the same general outline approach: It uses the trailer template to define how many seconds of video there are per scene, and where the titles go. You can replace the preset title text with your own by tapping it and typing in replacement phrases; as for the video, it’s simple enough to browse through your available clips: The app uses the time limit on the scene to create an excerpt on longer clips, and you can tap and drag to select which section of the clip you want to use. (If you have clips that are too short, iMovie will automatically gray them out to let you know you can't use them in this shot.) You can’t mash two clips together in one trailer scene without editing them together and exporting them in a separate project. If you don’t have pre-filmed video imported from iPhoto, your camera roll, or the Camera Connection Kit, tap the camera button to capture a scene: The app will perform a three-count, then film however many seconds of video is needed to fill the scene. If you use a longer clip, you can change where it starts and ends after adding it to a project. Once you've added video to your project, you can skim through the storyboard by tapping and holding until the red skimmer shows up. If you've used a longer clip in a scene and aren't happy about where you've begun and ended that scene, tap that clip to reframe. Sadly, you can’t customize the trailers beyond filling in these text and video blanks—it’s more like a Mad Libs for short film, rather than any sort of fully modifiable template. That works to your advantage if you just want to cut together something short and sweet, but it’s a little more annoying if you like to control your edits. I will say that despite that, I had a lot of fun putting together a Saul Bass-inspired trailer in just under half an hour. The app makes it very simple and entertaining—sometimes, it’s just a little too simple. 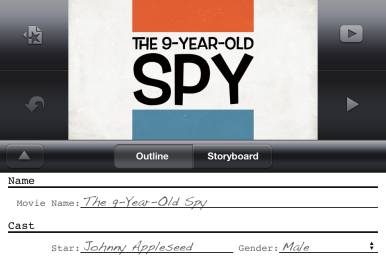 As with the rest of iMovie’s operations, I found it perfectly serviceable to cut together trailers on either the iPhone or the iPad, though the iPhone’s smaller screen makes adjusting text within the storyboard a little painful. Not all devices will be able to enjoy the joy of putting together a trailer, unfortunately: The feature is only available for the iPhone 4 or later or iPad 2 or later, presumably due to graphics and hardware issues. While the trailers are fun enough to play around with, iMovie also received a few other tweaks in 1.3: a new icon; a few graphics changes, including a revision of the undo button (it’s been switched an arrow to better reflect the buttons in GarageBand and iPhoto); a button to preview audio within the audio browser; exporting and playing 1080p video; and a new swipe up gesture within the timeline to create a freeze frame. And though this isn’t in iMovie proper, GarageBand now offers an “Export to iMovie” option when creating a song, allowing you to provide a custom score for a project.